After the traumatic period of British rule Indian economy almost reached to its pinnacle of economic break down. The country faced tremendous issues in setting up a proper economic infrastructure again. In order to develop the economy the Indian government recognized the role of standardization and the Indian Standards Institution (ISI) came into being on 6th January, 1947 and later on in June, 1947 Dr Lal C. Verman became its first director .It was done to bring simplification in industry & commerce and also to bring rise in the quality of products. In the initial years the organization provided standardization to consumer, and soon in the year 1952 Certification Marks Scheme came into being under which Indian Standards Institution (Certificate Marks) Act,1952 started providing licence to the manufacturers in order to use the ISI mark on their products. The licence was provided only after fulfilling the requirements as mention the Certificate Marks Act,1952 and to test this a nucleus laboratory was started in the year 1963. The workmen of the Indian Standards Institution made some demands under the Societies Registration Act, 1860, which were not accepted by the management and the dispute arise was taken into conciliation. As the conciliation officer wasn’t able to resolve the dispute he made a Failure Report to the Governor who referred the case for adjudication to the Industrial Tribunal. The management raised a preliminary objection before the Tribunal that, ISI isn’t an ‘industry’ within the meaning of section 2(j) of Industrial Dispute Act, 1947. Therefore it was held that, as the dispute wasn’t an Industrial u/s 2(K) of Industrial Dispute Act, 1947 the matter cannot be resolved in the tribunal, also the Governor didn’t had any jurisdiction to forward it for adjudication at the Tribunal. After the occurrence of above mentioned dispute the members of the organization felt a need of a recognized organization with a wider scope and with proper rules and regulation. ISI since beginning was not governed by any legislation and because of that it didn’t had any proper legal reorganization for making the economy more strong, as rapid changes could be seen. The Government enacted against the issue and Bureau of Indian Standards Act was made on 26th Novemeber,1986. From 1st April, 1987 Bureau of Indian Standards(BIS) replaced ISI and took over its functions and assets. BIS consisted of legal framework and provisions and as it had a wider scope the institution got new responsibilities. BIS looked into the matters of providing harmonious development of standards, satisfy the need and quality of goods and services through the Certification schemes of BIS, to provide effective services and also to generate awareness regarding the standards, standard marks by setting up seminars, campaigns etc. A question arises that, why standardization has been given such an important role in the development economy? The answer s simple that, Yes Standardization does play a very vital role, just think of the scams which would have proliferated if proper set of rules wouldn’t have been made, would it had been possible to get good quality products, the manufacturers and sellers could have easily committed an act of fraudulence. If Standardization wouldn’t have been given the utmost responsibility, there wouldn’t have been a stabilized economy and most importantly there wouldn’t have been any safety or security of goods and services. 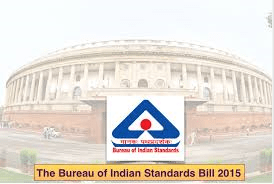 Bureau of Indian Standards is not just an act, but a corporate body which comprises of 25 members representing both Central as well as State government, Members of Parliament, industry, research institutions etc. The President of the BIS is Minister in charge of Ministry of Consumer Affairs, food and Public Distribution and the Vice-President is the Minister of State or Deputy Minister of Ministry of Consumer Affairs, food and Public Distribution. • It was noticed that despite of the fact that BIS was function as a National Standards Body(NSB), the Preamble of the act didn’t had a clear mandate to be termed as National Standards Body(NSB). • There were no specific provisions made for ‘Hallmarking’ of precious metal article/jewellery. • There wasn’t any flexibility in providing registration. • The Bureau didn’t have any powers to collect samples. Right after coming across all these issues, the officials faced the need of amending the Act. The whole process of standardization was in the favour of the producer and not the seller, especially in the case of jewels and after facing the shortcomings, it was decided to bring the seller under the regime of standardization, in order to protect the customers from buying unscrupulous jewellery and the need of enforcement of ‘Hallmark’ on the ornaments sold within the country was felt. The committee struggled with a lot of issues, as they wanted to amend the act in such a way so that it can be beneficial for the consumers. They also wanted a way to keep a check on the originality of the goods. For drafting the bill, different ministries were invited for consultation. Before submitting the final report of the bill to the Cabinet, the suggestions of all the ministries invited were taken into consideration. On 3rd May, 2012 the Cabinet gave the approval and the Bureau of India Standards Bill, 2012 was presented in the Parliament. In the following bill, the committee recommended setting up of a forum or tribunal under the Bureau of Indian Standards where the issues and complaints related to misconduct and fault execution can be dealt with. The Bill of 2012 wasn’t really an amendment. In the following bill, the suggestions from the proposed committees were taken into consideration, those suggestions were not used into practice and because of that the need of amendment stayed stand by. In the year 2015, the Bureau of Indian Standards Bill was introduced by the Union Cabinet Minister chaired by the Prime Minister Narendra Modi. The new bill constitutes of proper legislative framework and the Bureau of Indian Standards Act, 1986 has been repealed. Bureau of Indian Standards Bill, 2015 has established the BIS as the National Standards Body of India. It will now perform its functions through a Governing council, consists of its President and other members. The bill enables the Government to bring such articles, process or services which are necessary for health, environment, safety, etc. under the certification regime. This bill has provided the Central Government certain rights which includes, to appoint any authority to verify the products especially the jewels before issuing the certificate, the Central Government can implement the hallmarking of precious articles etc. By keeping in mind the issues which was faced in the act of 1986, this bill also prescribes certain penalties which will be charged for improper use of the standard mark and for selling of products without the standard mark. If a person is held liable for any of the mentioned offence then he will be charged with punishment of fine of five lakh rupees. Even if a company is held guilty of any offence under the bill then the company as a whole will also be charged with penalties. Lastly, the bill has also introduced a new reform regarding filing an appeal. Now an appeal can be filed for granting or licence or certificate or compounding of any offence, to the Director General of the Bureau. The bill also states that if the person is not satisfied with the order passed by the Director General of the Bureau then appeal can be forwarded to the Central Government. The provisions of the Bureau of Indian Standards Bill, 2015 empowers the Central Government and the Bureau in order to promote a culture in providing quality in goods and services in compliance with the provisions of process of certificate of conformity and product certification with an aim to improve the consumer’s welfare.